It is always a privilege to be talking to someone who has raised foodie kids. That means you are talking to someone who has been foodie as a kid and has imbibed a lot of flavours since childhood, has adapted old cooking techniques with new ingredients and also has infused flavours of the past into the present day food. Albeit with a little complaint about the quality of meat and fish and everything else that we get in today's world, they whip up magic in their food day after day. Keeping a bit of history alive through food and flavours. 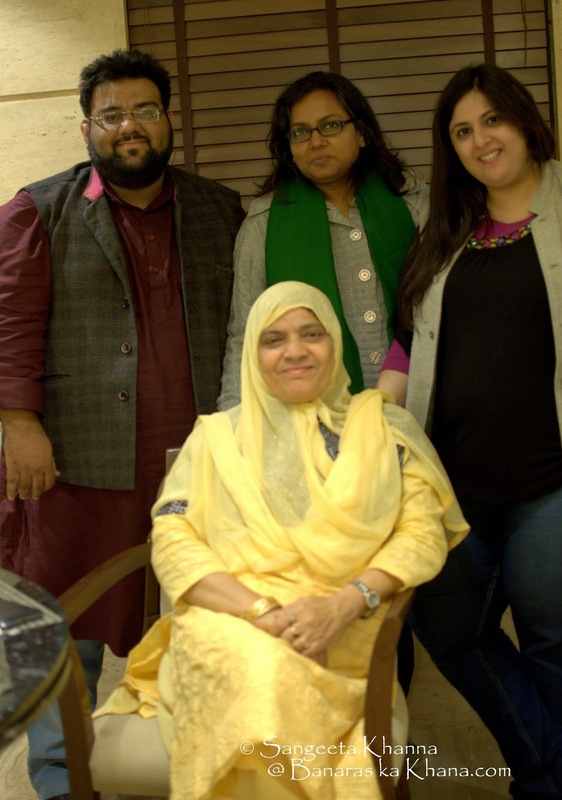 We met Mrs. Nazish Jalali the day before and was completely floored by the way she told stories of her childhood spent in the royal state of Rampur where she got to taste and replicate food cooked in the erstwhile royal kitchens. Brought those recipes to her marital home and learnt Old Delhi food here in the tutelage of her mother-in-law. She loves sharing these stories with whoever is interested in them. 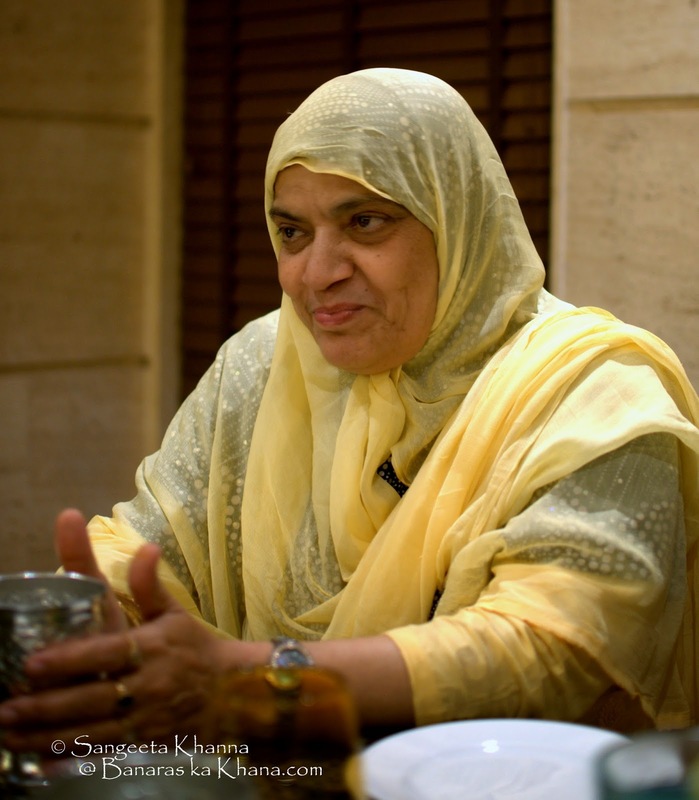 Her son Osama Jalali, is a well known food critique and is compiling recipes of Rampur into a book these days, trying to revive the dying art of cooking slowly with love and real spices, treating the spices the way they are intended for the season. He talks elaborately about the meat cuts to be used in a particular kabab or curry and what would be the test of a wrong cut being used in kachhe gosht ka kabab etc and his mother chips in the with the little story about how he was enamored by a live tandoor in a family wedding and has been photographed peeping inside the tandoor, all at a ripe age of four. Yes, barely walking and smitten by food and it's making, that is Osama for you. 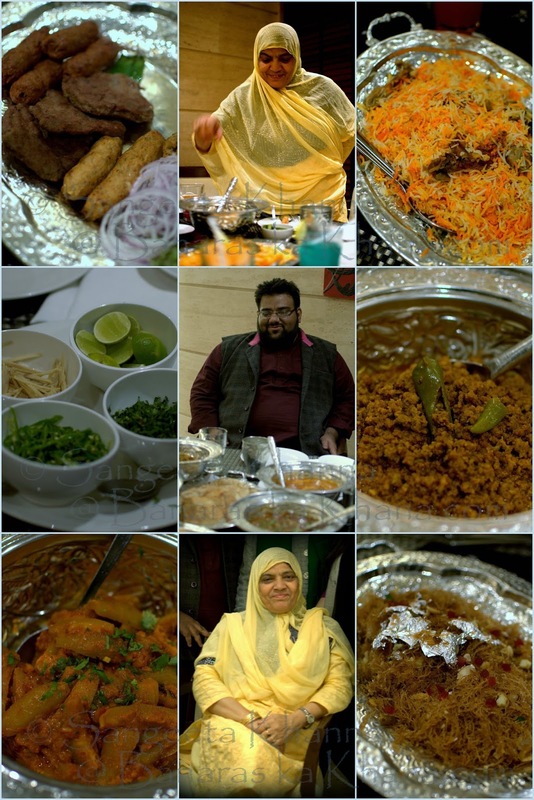 This 'Shahjahanabad ki sair' is a food festival on the lines of a pop up event where Osama and Nazish, the mother-son duo have curated the menu and have been cooking everyday along with the hotel staff to bring the accurate flavours of home cooked food from Old Delhi. Delhi in older times was known as Shahjahanabad and we did take a walk through the lanes hearing stories of a 24 hr clinic of Osama's father and how all the khansamas of old Delhi were his patients and often the gratitude used to come in the form of Korma or Nihari. The first question I asked the Jalalis was about the difference between the street food of old Delhi served famously at Karim's and Al Jawahar and the home cooked food in the same lanes of the city. Pat came the reply clearing all my doubts. The street food was meant for the worker class that slogged hard during the day and needed a robust rich meal to nourish themselves. The worker class had little time and resources to cook for themselves and had almost no finesse to appreciate delicate flavours and light cooking. 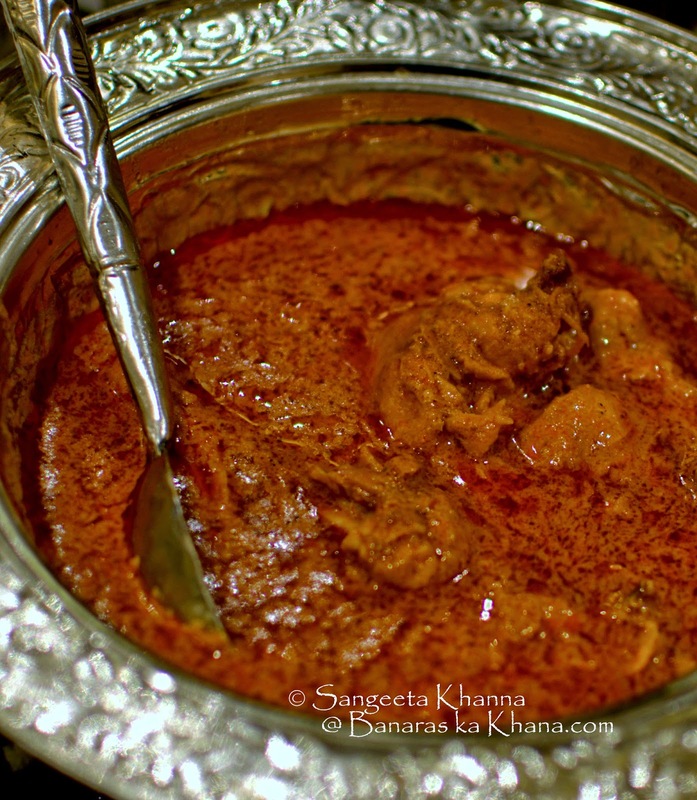 They relished the hot spicy and robust curries slow cooked by these khandani khansamas and found good nourishment too. That doesn't mean that the old Delhi street food is any less in it's popularity, we have been going there to relish the robust richness quite often ourselves. On the other hand home cooked food has always been lighter and a delicate blend of spices differentiates it from the food we find on the streets. Many of these meat curries are cooked with vegetables and those Bhidi Gosht, Arbi Gosht, Lauki Gosht, Shalgam Gosht etc we wouldn't find anywhere in the old Delhi shops. The vegetables cooked in old Delhi homes would never be served on the street shops. This Parval ki subzi was so good I ate it like a salad. 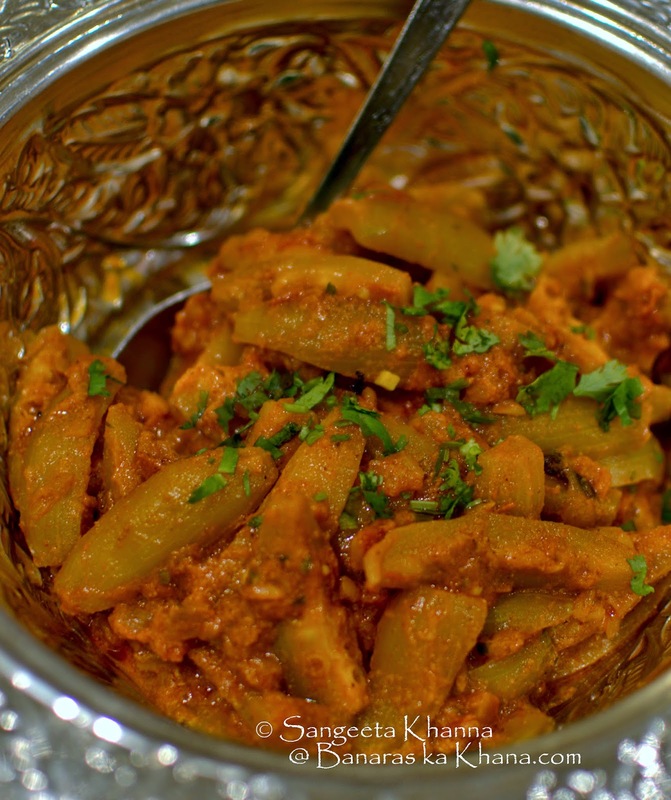 Tomato infused masala with mild spices and the parval cooked just right. We got to taste this Alu Gosht that was so good it felt like potatoes were born to fall for this slow cooked meat curry. We had very small portions to taste because we had to taste a lot of food, else I would have loved this curry on it's own as a full meal. But before that we had a taste of the Kabab platter that had chicken and mutton seekh along with a Kachhe Gosht ka Kabab that was a class apart. Made using 'raan ka gosht' (meat from the thighs) this kabab was all meat infused with cardamoms and light garam masala. The seekhs also had prominent notes of Badi elaichi but very balanced spicing. Then came the Nihari that was enriched with the bone marrow from goat shank and we could taste the richness imparted by the marrow. 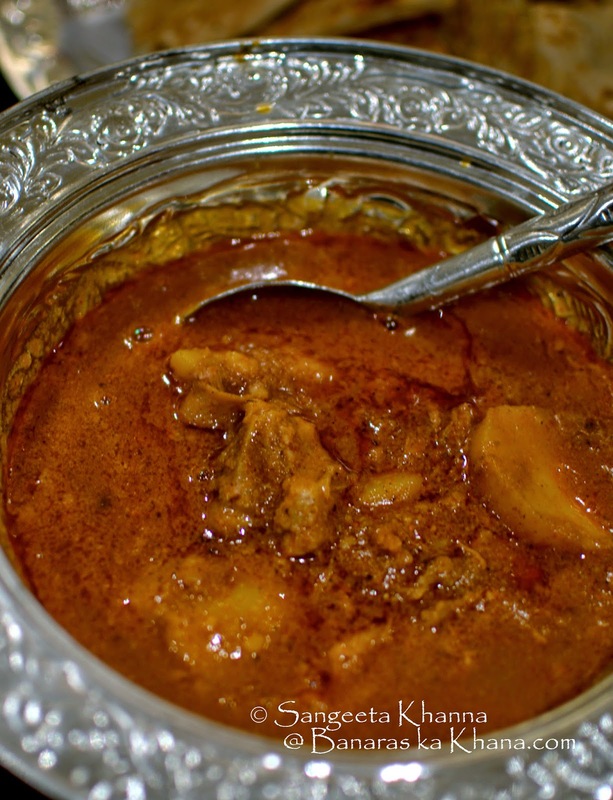 Nazish starts cooking Nihari first thing in the morning and slow cooks this meat for 6-7 hours so that you get the gelatinous gravy and melt in the mouth meat. We loved the Mutton Korma and the Hari mirch ka Keema which is richly infused with the chilly flavours of the thick skinned fat chillies from Rajasthan but you wouldn't find any chilly heat in it. 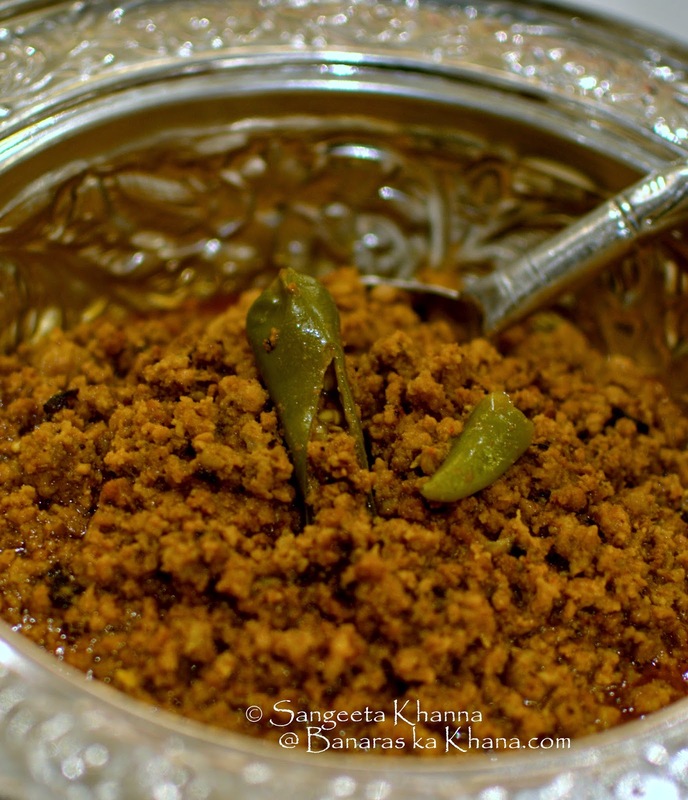 It was quite different from the Lasun Mirch wala keema that I cook. Biryani was well done with meat cooked to perfection and the grains of rice infused with the flavours of meat and spices, just as it should be. The Biryani in old Delhi is served with a red chilly chutney that I liked a lot, even after being partial to Awadhi Biryanis cooked with basmati rice. Desserts were Zarda and Sewaiyyan. Both done well though I don't eat desserts much. We all had a paan and enjoyed it to the last bit. This was one shahi dawat that felt like being served in a cozy private dining room in heirloom 'tin plated' copper ware, even water being poured out of antique jugs. See how I am chewing pan even in the picture we got clicked to call it a day. 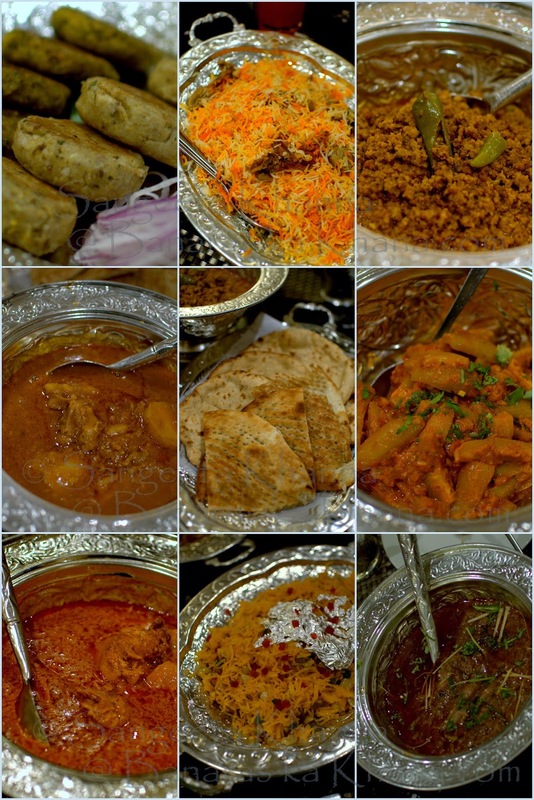 More than the momentary pleasure of the sensory faculties, this dawat was an education that will be with us forever. Thanks to Osama and Nazish Jalali for hosting us and treating us with the stories to remember.